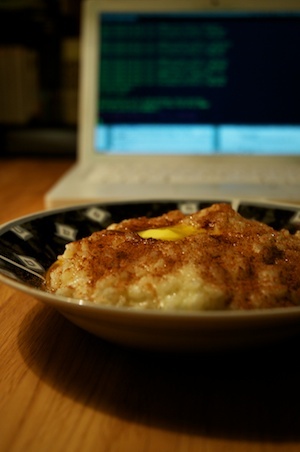 "Risengrynsgrøt" (literally rice grain porridge) also known as "risgrøt", or just "grøt", is a common thing to eat all year (except perhaps in summer), but it has special significance around Christmas. It is frequently served at a "juletrefest" or other pre-Christmas gatherings, and is often used as lunch in Christmas eve. In such cases, it is usually refered to as "Julegrøt", even though the recipe is the same as the rest of the year. For the julegrøt, it is traditional to add one almond to the pot shortly before serving. The person who finds the almond wins a prize, which is usually a marzipan pig. It is very easy to make risengrynsgrøt. You need about 0.5 liters of milk and 0.1 liters of rice per person. You can get special porridge rice, but normal rice works perfectly, at a quarter of the price. Put the rice and milk in a pot, add a tiny pinch of salt, and bring it to a boil while stirring almost all the time. Then you turn down the heat enough to keep it almost boiling, and stir frequently for about 20 minutes. Serve with sugar, cinnamon and a piece of butter. Camilla tells me risengrynsgrøt is known as rice pudding in English, and that our English speaking friends all seem convinced that it is actually a dessert, not a dinner. I am fairly sure that this must be based on a misunderstanding by the English speaking peoples. It is perfectly understandable, however, as there is a dessert which is make largely from risengrynsgrøt. It is called "riskrem" (rice cream), and is made simply by mixing cold risengrynsgrøt with whipped cream, sugar and vanilla. I observed this misunderstanding at work no later than Thursday, at the julebord for the section for applied physics, when an American professor, while eating riskrem, told a Russian professor that some other professor would eat this (indicating the riskrem) every Friday in the canteen. However, what they sell every Friday in the canteen is of course risengrynsgrøt, not riskrem. As a side, I recommend something pythonic. A bit of django hacking, for example. Not fortran, that goes better with flat bread and water. I'm sure that would be a lot more fun than studying for the Oracle Certified Master, Java EE 5 Enterprise Architect certification.... sigh.